Sear Bliss (1993-present) is a Black Metal band from Szombathely, Hungary. ear Bliss was formed in the autumn of 1993 by 15-year-old András Nagy and Csaba Tóth (ex-Extreme Deformity; bass). The first line-up also featured János Barbarics (guitar) and Norbert Keibinger (drums) from Hungarian death metal band Animosity. Tóth left the band soon with Nagy assuming bass. Zoltán Csejtei (ex-Extreme Deformity; vocals) joined them, and soon the line-up was enriched with a synthesizer by Winter and trumpet by Gergely Szucs to create a unique sound for the band. Keibinger left the band in April 1995 as they were working on their first demo. Since there was only a short time until recording, Balázs Bertalan (of Extreme Deformity) acted as session drummer. That demo, The Pagan Winter, arrived the next month. Soon after signing to 'Mascot Records', Winter was replaced by trumpeter Szucs to pursue other musical endeavors, but soon later returned. Soon after, Zoltán Csejtei assumed the drum position, Nagy became vocalist again as well as bass duties. In August Sear Bliss played their first gig. The first album, Phantoms, arrived in 1996. The Netherlands' leading metal magazine, Aardschok awarded it the title of "CD Of The Month". It was the first (and only) time in the magazine's history that the award went to a black metal album. The track, Aeons Of Desolation, would find its way onto the compilation CD of the Dutch progressive rock magazine IO Pages. Due to the potential success, 'Mascot' decided that The Pagan Winter demo would be released on CD featuring a 12-minute bonus song, In The Shadow of Another World. Sear Bliss played their first European tour supporting Marduk in February-March 1997. After finishing the tour the Csejtei brothers left the band, with Winter departing soon after. Recruited new members were Zoltán Schönberger on drums and Viktor "Max" Scheer on guitar, while keyboards were taken over by trumpeter Szucs. The Haunting (1998), the next album, was a more atmospheric and varied album than the previous that featured fast black metal tracks. The new album disappointed some old fans, but it appealed to new followers. The opportunity to tour for three weeks with the Norwegian melodic black metal band Ancient was declined because of the band membership commitments of school and jobs. With the release of The Haunted, their contract with 'Mascot' was satisfied. A new demo was released in an effort to impress a new label in 1999. But once again membership changes followed. Previously parting with Viktor Scheer (guitar), then founding member/guitarist Barbarics and long-time trumpeter/keyboardist Szucs quit due to personal conflicts within the band. During the transition, the act played live with session musicians, with the only official members being Nagy and Schönberger. A new guitarist, Andras Horváth P., would eventually be found. In the beginning of 2000 Sear Bliss recorded two brand new songs in their hometown Szombathely, but the studio work of the third full-length album started only at the end of the year with new members István Neubrandt (guitar) and Zoltán Pál (Trombone). The album Grand Destiny (2001) was released by a new Hungarian metal label, 'Nephilim'. Before the release, Horvath P. left and former Sear Bliss guitarist Csaba Csejtei returned. Later, Olivér Ziskó (ex-Cavum) joined as the new keyboardist. Thanks to the warm welcome that Grand Destiny received abroad, Sear Bliss started negotiations concerning a new contract with foreign recording companies again. Eventually 'Red Stream', the overseas distributor of previous Sear Bliss albums, offered a three-album record deal to the band. The label started by re-releasing Grand Destiny in the USA (one year later than the original release). 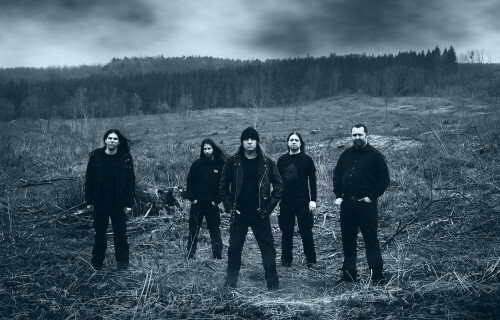 Returning to a more intense style of black metal, Forsaken Symphony, arrived in October 2002. This new album included distribution into Eastern Europe, reaching new audiences in Russia and the Baltic states. The band then played the Brutal Assault festival again as well as a club tour in Europe accompanied by Skyforger. Sear Bliss toured in Benelux as a headliner for the first time in March 2003. They supported Marduk, Immolation and Malevolent Creation in Budapest in April. In February, 2004, Sear Bliss celebrated their 10th anniversary in Budapest where former members joined the band on stage for a one-off show. A video was shot of the event and appeared on the Decade of Perdition DVD, along with a documentary of the 10 years of act's history. In August 2004 the new album, Glory and Perdition was released, featuring Mayhem and Tormentor vocalist Attila Csihar in two songs, Birth of Eternity and Shores of Death. The band then shot the first promo video in their career for the song Two Worlds Collide. Despite the success of the latest album, Csejtei left the band again to be replaced by Péter Kovács. However, the greatest news of the year 2006 was the act's signing to 'Candlelight Records'. Another contract was signed with Dutch 'Vic' Records, however, for releasing remastered editions of the first three albums with bonus tracks; along with certain parts of The Haunting being re-recorded. After four months of studio work, the longest session ever in their career, The Arcane Odyssey (2007) was released, getting a high ranking by Kerrang, Terrorizer, Heavy Oder Was and Rock Hard magazines in Europe. The album getting elected for "Album of the Year" on Hungarian Metal Awards in 2007. The main event for the band in 2008 was their 15th birthday show in November in Avalon Club, Budapest, where the original Sear Bliss line-up played together again after 11 years. A few weeks before the concert, guitarist Péter Kovács had left, with brother Attila Kovács joining from Hungarian experimental death metal band Watch My Dying. At the end of August 2009, Andras Nagy found himself alone in the band after a bit of a coup; the other four members deciding to form a new band called I Divine. Nagy recruited a whole new line-up from former Sear Bliss musicians. guitarists Csaba Csejtei and János Barbarics as well as Oliver Zisko on drums. In December they found trumpeter, Balázs Bruszel. Eternal Recurrence containing progressive, experimental black metal was released in January 2012. Letters from the Edge would follow in 2018.